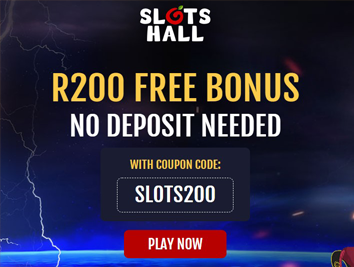 Slots Hall Casino is a brand new online casino targeted at South African players, though players from other countries are accepted too. The casino is powered by Real Time Gaming (RTG) software. Real Time Gaming is a veteran online casino software provider that is known for high quality games that come with excellent graphics and animations, great sound effects and loads of cool features. South African players get to choose from a portfolio of more than 300 top-class games. These games include slots, table games, video poker, specialty games and progressive games. SlotsHall casino is player-friendly and is completely fair and secure. The casino also offers excellent payment support and dedicated customer support through multiple channels. You can play your favourite casino games on the go at the Slots Hall Casino. All you need is a smartphone or tablet that is compatible with the Android, iOS or Windows Phone platforms. You can play the games at the mobile casino in real money mode as well as free practice mode anytime and anywhere. All games at SlotsHall casino are developed on the HTML5 platform, which provides a responsive design interface. The game range is limited at the mobile casino: only about 120 games compared to the 300+ at the desktop casino. However, the games come with full HD graphics, exciting animations and loads of features. All the popular RTG slots are there at the SlotsHall mobile casino, including games like Eternal Love, Samba Sunset and Caesar’s Empire, along with new games like I, Zombie and Plentiful Treasure. You also get a few table games and a good selection of video poker games along with the RTG jackpot games. You can open an account directly at the mobile casino. And if you have an existing desktop SlotsHall account, you can use those credentials to log in and play. Slots Hall Casino offers 2 cool bonuses to new players. The first is an exclusive no deposit bonus available only if you access the casino through our website. This bonus gives you R200 free that you can claim using the coupon code SLOTS200. Just when you are done with this bonus you get a superb welcome bonus of 350% up to R20,000 and 50 free spins across your first 2 deposits. You get a 200% bonus up to R10,000 along with 20 free spins on your first deposit. On your second deposit you get a 150% bonus up to R10,000 and 30 free spins. This bonus comes with a 20x wagering requirement. The free money casino bonus is great because it gives you a chance to try out the real money mode without spending your own money. And the welcome bonus is huge as well. Even better, there are bonuses beyond these as well for existing players. • Game of the Month: 75% bonus and 10 free spins on game of the month – it is Cubee this month – with coupon code CUBEE75. • Rock’n’Roll Monday: 125% bonus on any deposit on a Monday with coupon code ROCK-MONDAY. o 130% bonus + 40 free spins with coupon code FRIDAY130. o 160% bonus + 20 free spins with coupon code FRIDAY160. o 1st deposit: 80% bonus + 25 free spins with coupon code SUNDAY80. o 2nd deposit: 110% bonus + 50 free spins with coupon code SUNDAY110. • Howzit Bru: 75% bonus on a single deposit daily with coupon code HOWZIT. • Hayibo: 75% bonus + 15 free spins with coupon code HAYIBO. • 100% Bonus? Yebo! : 100% bonus with coupon code YEBO100. • Have a Lekker Day: 100% bonus + 20 free spins with coupon code LEKKER. • EISH! What a Deal! : 115% bonus + 25 free spins with coupon code EISH115. • Just Sommer: 120% bonus + 30 free spins with coupon code JUSTSOMMER. • It’s Jol Time: 125% bonus + 40 free spins with coupon code JOLTIME. SlotsHall casino has a strong portfolio of RTG games. Slots form the bulk of this portfolio, and you get classic slots, video slots as well as progressive slots. Other games include a good selection of table games like blackjack, baccarat, roulette, Caribbean Stud and others. If you don’t dig these you get some cool video poker games and specialty games as well, including the brand new board game, Banana Jones and Fish Catch. The casino also provides some awesome progressive jackpots and also fixed jackpot games that are triggered randomly, giving everyone a fair chance of pulling off a big win. The software powering SlotsHall casino is provided by Real Time Gaming. RTG is very popular among operators as it gives them the leverage to customize based on their preferences. You get the software in download, instant play and mobile casino modes. The games all come with exciting graphics, superb animations, complementary sound effects and great features, especially the slots. At Slots Hall Casino, one thing that you will never run short of is promotions. There are a massive cache of promotions that include deposit bonuses, free spins, weekly bonuses, weekend bonuses and much more. Visit the casino’s Promotions page for details about the range of promotions and bonuses available currently. The casino also has a good loyalty program that rewards players with comp points that they can redeem. We definitely recommend that South African players try out Slots Hall Casino. This casino looks good and has the games and promotions to back those looks up. The use of 128-bit SSL encryption ensures complete security for all your payments. You can pay in Rands – or in Euros (€) if you are a player from outside South Africa – using credits cards from Visa, MasterCard, American Express and Diners Club International, Visa debit cards and eVouchers, e-wallets like NETeller, Skrill and EcoPayz, locally popular methods like EasyEFT and EFTpay and also Bitcoins. All of this guarantees you a fantastic gaming experience when you are here!